With the 3-0 win over Fluminense, Palmeiras extends its unbeaten streak in the Brasileirão to nineteen games and closes in on the 2018 championship title. RIO DE JANEIRO, BRAZIL – On Wednesday, November 14th, Palmeiras dominated Fluminense en route to a 3-0 victory at Allianz Parque in São Paulo. With the win, Palmeiras can clinch the 2018 Campeonato Brasileiro (Brasileirão) Série A championship this coming Sunday, November 18th. Felipe Melo celebrates his goal against Fluminense in last night’s 3-0 win for Palmeiras at Allianz Parque, photo courtesy of SE Palmeiras. The Verdão entered last night’s matchup riding a remarkable eighteen game unbeaten streak in the Brasileirão. Ironically, the last team to beat Palmeiras was their opponent last night, Fluminense, who beat Scolari’s club 1-0 way back on July 25th. Palmeiras took control of the game from the start, with Fluminense looking flat-footed for most of the first half. The Verdão’s effort finally paid off right before the half. At the 40th minute, a deflected cross fell right to the feet of Pameiras’ Miguel Borja who punched in a close range shot for the 1-0 lead. Flu came out more aggressive in the second half, but Palmeiras was more than happy to sit back and wait for counter-attack opportunities. Finally, at the 82nd minute they doubled their lead off a rocket fired by Felipe Melo from the edge of the area to make the game 2-0. At the 89th minute, Palmeiras put the nail in the coffin as Scarpa’s free kick sailed across the penalty area to find Luan at the far post to knock in the game’s final goal. With the 3-0 win, Palmeiras extended its unbeaten streak in the Brasileirão to nineteen, matching a record set by the Corinthians last year. 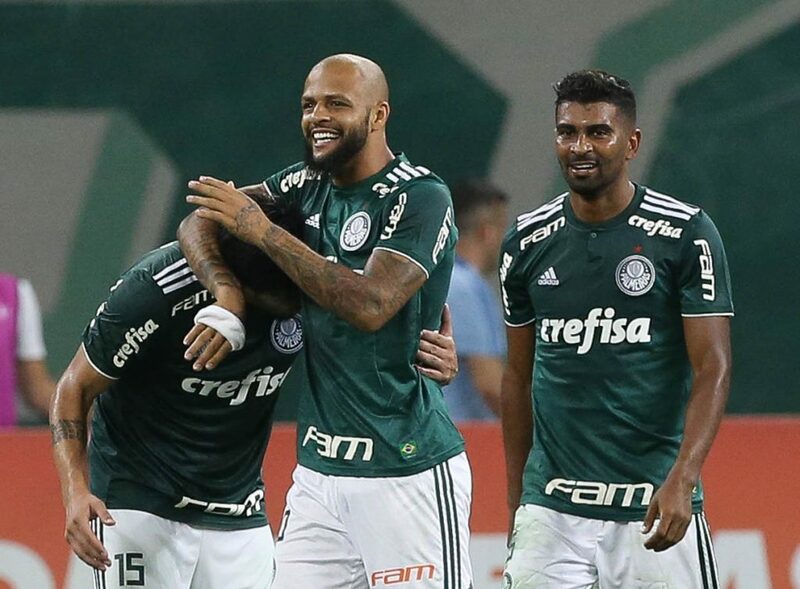 Palmeiras also finished the night sitting atop the standings with seventy points, eight more than second-place club, Internacional, and ten more than Flamengo. In order for Palmeiras to have a chance to clinch the championship this coming Sunday against Paraná, Internacional must lose tonight’s (November 15th) match against América-MG and its next match against Botafogo on Sunday (November 18th). In addition, Flamengo must lose one of its next two matches, either to Santos on Thursday or to Sport Recife on Sunday.